Ania's graduation was bitter sweet for me. I am excited to see her growing up into a smart and beautiful little girl. On the other hand, I can't believe she is going to school. Somehow, I missed a lot of Ania's baby and toddler years. It seemed that I was either preoccupied with Eli's constant ear infections, or I was having a difficult pregnancy, or being sleep deprived, or just trying to make it working full time. Meanwhile, Ania was not an easy child - strong willed and temperamental (I don't know where she gets that:) ). Here we are, my little baby is not so little any more. A big part of me wants to hang on to a few years of complete innocence and sweetness. 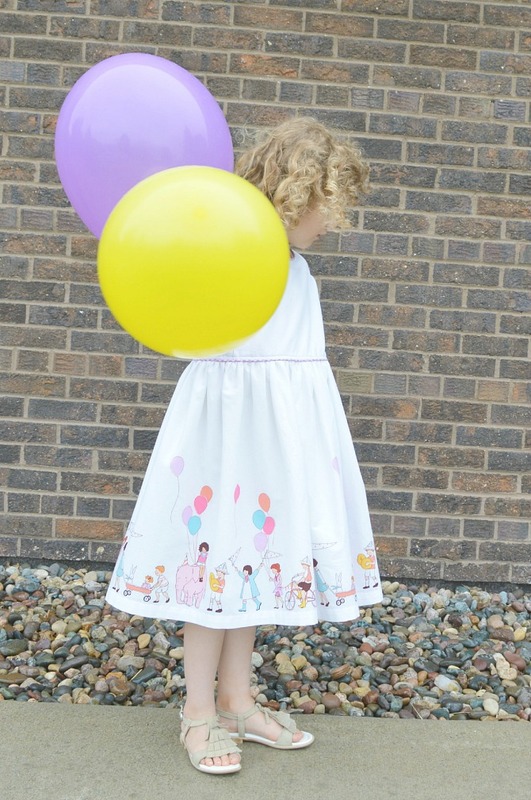 That desire drove my fabric choice, the ubiquitous Children on Parade print by Sarah Jane. 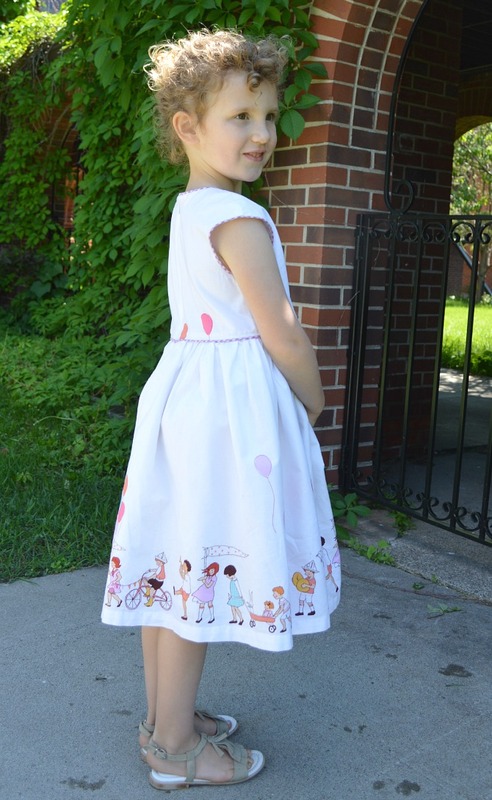 Let's face it, how much longer will I be able to sew sweet dresses in cute prints before she rolls her eyes on me. Speaking of print, notice the perfect print match on the seam. No heads were chopped off. Phew! :) It might be my most proud accomplishment. LOL. 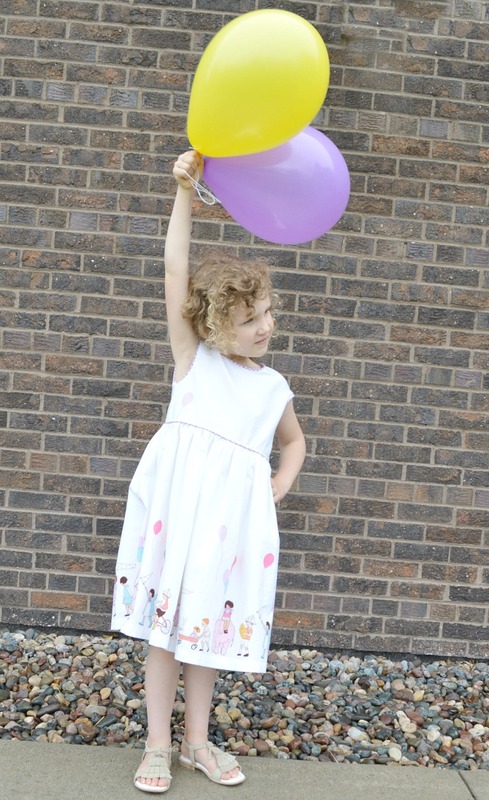 The pattern is The Caroline Dress by Mouse House Creations. It is a very well done pattern; the fit is great and the instructions are so easy to follow. If you are intermediated by invisible zippers, try the pattern. Hayley's instructions are superb! 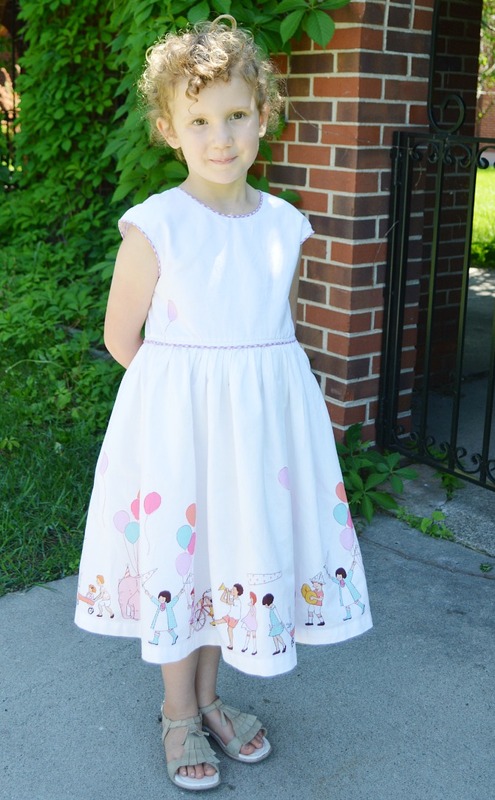 Ania loved her dress and thought she looked beautiful. Here comes the funny part. She attended a Russian preschool. Graduations are huge celebrations where kids sing in a choir, recite poetry, perform dance routines, etc. Upon our arrival, the dress was deemed not glitzy enough for the performance and she was changed into this. Yep, I have no words either. They are lucky I have a good sense of humor. LOL. Olga, I loved your post! The dress is lovely and your daughter looks really sweet. Great dress and funny story Olga! I've always loved that fabric. I love your little dress, such simple clear lines, that really shows off the fabric...And I know exactly what you mean about that 'bittersweet' growing up. My Missy, 4, now tells me that she wants to wear t-shirts not dresses...and she'll be starting school in September. This cute dress phase is so short! Ha ha, what a hilarious story! Your story is great and the dress is I beautiful. I'm saving that fabric for my little girl but your post made me think about how many time I have before I can make more dresses for her. And the other dress, haha. It's ready for the Brazilian Carnaval!! Congratulations for her graduation!! Lovely dress! I love this fabric and design combination, so perfect! While your daughter looks pretty in anything, I think she looks so sweet in your dress. 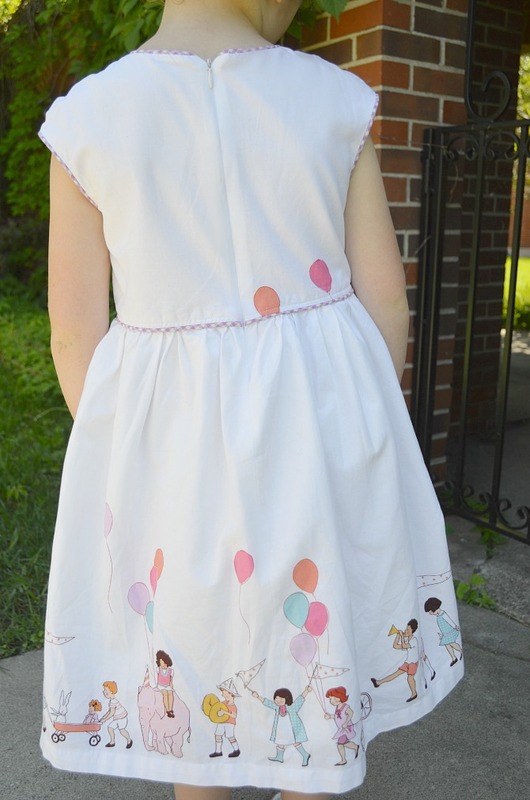 Your post reminds me I have to use up those cute fabrics I have before my daughter grows up!! This is amazing!!! Beautiful dress and beautiful girl! Hahahaha....that is quite the 180 in dresses she had going on that day. I love the culture behind it, though... What do the little boys wear? ;) Love your dress in that fabric...and the piping. (is that piping, or bias tape trim?) And you are right about dressing them up in sweet prints while you can... sigh. I was just thinking what clean lines, adorable piping and how much I love your fabric choice....what was that school thinking? Your style vs theirs - well, I'd vote for you any day.